Skip James is one of Beck's favorite blues musicians, and certainly the most influential, perhaps second only to Mississippi John Hurt. James plays a more personal, acoustic blues, and is one of the most famous of the original generation of bluesmen. He's known for his eerie, high falsetoo and playing a complicated finger-picking style of guitar. Beck's slight, lively rewrite of James' "Jesus is a Mighty Good Leader" is the lead-off song on One Foot in the Grave. 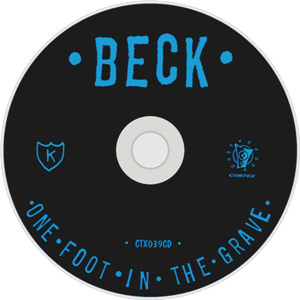 Beck recalls being a teenager and practicing the fingerpicking blues style all day long, especially after he had dropped out of school. That practice shows here as he effortlessly picks his guitar and sings and stomps his foot. The original Skip James song has a similar, but not exact, guitar line. Beck has a more innate sense of pop melody, and thus his guitar and vocals are a bit catchier to the ear. Skip's performance is rawer. I love how Beck's guitar strings buzz and ring throughout the song, and he's stomping his foot the whole time. This is the sound of Beck playing in your living room, singing his favorite songs. As you can see, Beck uses two of those, omitting the "Let Jesus lead you" verse. "He's A Mighty Good Leader" does make it into Beck's setlists on occasion. The earliest I have heard is from October 21, 1994, which was a VERY short version, but it did have some nice slide guitar. Another pretty version was during the acoustic set in Paris, France on March 21, 1996, as he opened for Sonic Youth. "I learned this one from a Skip James record," he shares before a fairly fancy display of blues guitar picking. The warped quality of the recording somewhat enhances the lo-fi blues feel of the tune! It's sort of like listening to a record from the 1930s, if you close your eyes and forget that Sonic Youth is coming up next. When looking for songs to play on the now-famous November 19, 1997 "country" concert, "He's A Mighty Good Leader" was a good fit. Beck played it as a two-man blues jam, with Smokey Hormel coming out to join him on slide guitar. They've done other songs as a blues duo, but January 10, 1999 and July 2, 2000 also saw versions of "Leader" done this way. Shortly after that, Beck was doing a solo set to open for Bob Dylan at the tiny El Rey in Los Angeles on December 16 1997. This performance of "He's A Mighty Good Leader" is a dazzling display of his blues slide guitar skills, and his vocals are very calming. In 2005, Beck took to playing his blues slide and singing "He's A Mighty Good Leader"--but instead of doing it complete, it was used as a short intro into "Hotwax." Seems like a weird combo, but both have some blues slide and they go together pretty well. He did this a bunch of times at the end of 2005 (September/October shows). Later in 2006, Beck played a short solo version of "Leader" (spontaneously, it sounds like) on August 26. He does a couple of verses, before the band starts in on "Whiskeyclone." The song than dropped away for awhile, until July 2013, when Beck was playing some small shows (had a bassist & pianist for some of the show, but mostly solo) in Europe. At the shows in Paris, France and Cambridge, England, Beck dropped "Leader" into his blues-heavy solo sets. This is an interesting report about Skip James. Other Skip James songs Beck has covered: "Devil Got My Woman,"�"Cypress Grove Blues," and "I'm So Glad."